Could angel investing be right for you? Want to be an angel? What you don’t want to do is jump in on a whim and the allure of big bucks. Yes, angel investing can bring you high returns, but it’s also high-risk. In a talk at Featherstone on Oct. 22, Kate Putnam helped us dive into some of the basic knowledge you would need to consider if you’re attracted to the concept. Putnam’s presentation was comprehensive and full of interesting asides, and here are just some of the key ideas I came away with. Putnam started with the first obvious question: What are “angel investors”? Well, the term didn’t originate in Silicon Valley or even Wall Street. Before launching into her presentation, Putnam shared that the term angel investors originally referred to investors in Broadway shows. The term began to enter the public lexicon with the musical “The Producers.” But unlike the producer and accountant trying to pull a fast one on the unwitting angel investors by creating a musical that was sure to flop so they would walk away with the invested money … in today’s world angel investors look at companies that want to succeed in order to make their money. OK, so now let’s turn to the business of being an angel investor in this context. Putnam defined angel investors as people who invest in startups, which are high-risk investments largely because you come in early, when there’s less of a proven track record, unlike institutional venture capitalists who invest other people’s money when there’s demonstrated revenue. Social venture companies are interested in doing good. Angel investors generally don’t choose these unless they are interested in investing in something that aligns with their own causes. In the normal growth category, as Putnam tells us, “the startup may be looking for financing, but not looking to sell off the company.” They’re not interested in being bought by a large company for a substantial amount of money, so this type of investment wouldn’t be attractive to angel investors. Angel investors, however, are usually interested in the next two categories. The first is high-growth startups, whose aim is to “exit” or sell for a lot of money to a bigger business that has the expertise and resources to scale up and take the product national, or to an even broader market. Here, theoretically, is when you would make a nice gain on your investment by getting back your initial capital and a large return. Putnam gave us the example of Annie’s Pasta (best known for the little bunny-shaped pasta pieces), which General Mills bought because it had already demonstrated success in the Northeast and could easily be scaled to take it nationwide. High growth generally brings in, says Putnam, $7 million to $10 million in revenue. Finally, you have the extreme-growth category, which is an even bigger gamble. As the name suggests, these companies have the potential for fast scalability and extremely high growth, and thus returns. But again, Putnam reminds us that conversely, they have a higher risk of bombing. Due diligence is imperative if you’re going to be an angel investor. After all, you wouldn’t buy a house without a professional inspector providing you with a thorough report. You need to put in the hours and ask questions about the startup you are considering. For instance, is there a strong management team working with the entrepreneur? Is there a market that exists for the product or service? How diverse is the board? Is it founded by a team or a single entrepreneur? Have they priced properly, developed a timeline, and very important, do they know what they’re doing? Putnam informs us that a study by First Round Capital reported that companies with a female founder did 63 percent better than all-male founding teams. She adds that since 2014, about 30 percent of new angels are women. An online Forbes article, “7 Factors for Deciding to Invest in a Startup — or Not,” also poses questions such as, Will the company be attractive to potential acquirers? Is it scalable, and if so, how soon can it be done? Does the potential exit provide the returns you’re looking for, and how much capital does it need? Still wanna be an angel? Don’t do it alone, is one of the recommendations Kate Putnam shared with us. While you can invest individually, sharing expertise, best practices, and insights are a huge benefit in, hopefully, making sound decisions. Possibly, too, among the angels there might be some who are willing to be mentors, thus helping the entrepreneur directly early on. The advantage of a well-chosen portfolio over investing in a single company is that it can increase your chances of making a better return. Putnam points out that the size of your portfolio matters too. You increase your potential with a portfolio of 10 to15 well-researched, group-funded, gender-diversified startups. Returns generally can range from about 14 to 25 percent. Putnam covered additional points in her concise presentation, but these are the basics. If you’re considering going this route, your next step is to jump into research about the field, including visiting the Angel Capital Association website, which has a great deal of useful information. 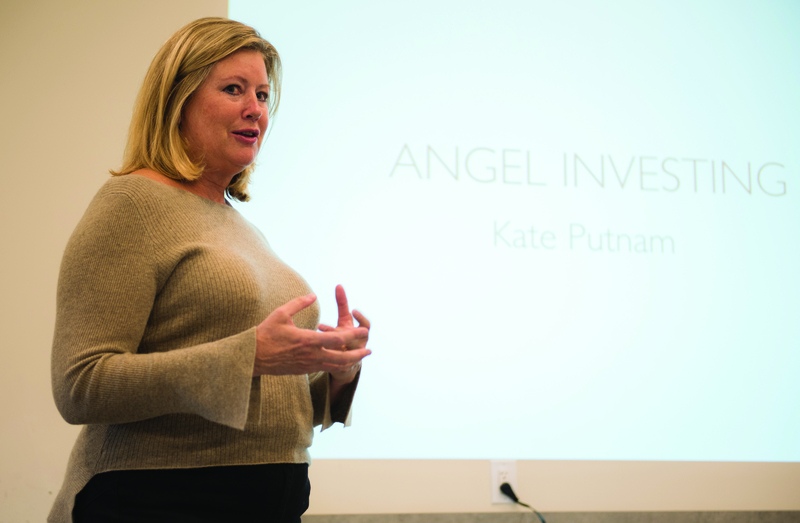 Kate Putnam is managing director of Golden Seeds, a national angel group with a focus of gender-diverse startups, and also mentors and serves as a judge at MIT, Mass Challenge, and Valley Venture Mentors.